Search Ends Off Australia For Two Cruise Ship Passengers : The Two-Way The couple went missing a day before they were reported overboard and authorities say it's not yet clear whether they fell or jumped. 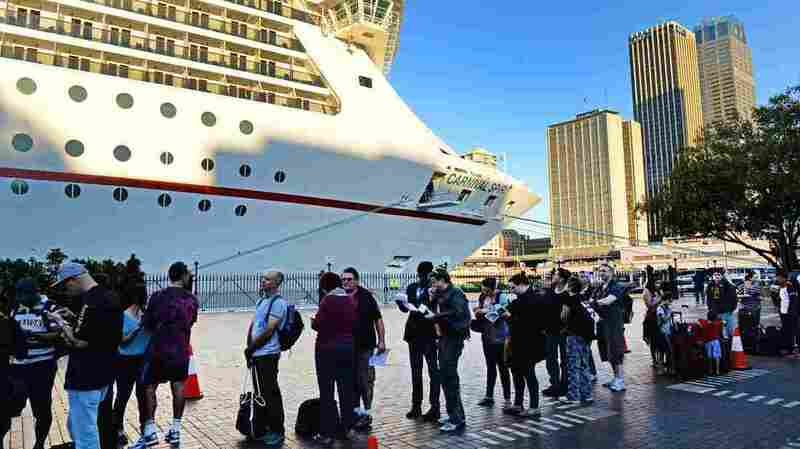 Passengers queue at Sydney's Circular Quay to board the Carnival Spirit for a Pacific cruise, on Thursday. The search is over for an Australian couple who went overboard Wednesday from the Carnival Spirit cruise ship as it sailed in waters off New South Wales, Australia, The Associated Press reports. That word comes as the cruise company said its ship "had higher railings than required to prevent accidental falls," the wire service adds. The missing passengers have been identified as "paramedic Paul Rossington, 30, and his 26-year-old girlfriend Kristen Schroder, both of the town of Barraba in New South Wales state," the AP says. It isn't known if they fell or jumped. But The Sydney Morning Herald is reporting about one theory being investigated: That Rossington may have been "valiantly trying to save his girlfriend when they both went overboard." Officials were not optimistic that an air-and-sea rescue effort would be successful in finding two passengers who went overboard from the Carnival Spirit cruise ship in Australian waters. Reuters reports that the passengers, apparently a couple, went overboard on Wednesday but that they were not discovered missing until the following day when the ship docked in Sydney harbor after a South Pacific tour. The news agency said search-and-rescue planes and boats were scouring a 500 square mile area off Australia's eastern coastline looking for the pair. "I must be honest, our hopes are fading because of the length of time but we are going full throttle to try to find them," NSW Police Marine Area Commander Mark Hutchings told Sky News television on Friday according to Reuters. Hutchings said the couple had gone off the ship "one after the other", but it was unclear whether they had jumped or fallen by accident. "New South Wales police say surveillance camera footage showed that the couple — a 30-year-old man and a 26-year-old woman whose names have not been released — fell from the ship's mid deck Wednesday night.
" ... indicated the pair went overboard from a deck about halfway up the ship's side, but [Hutchings] added it was too early to say whether they jumped or fell overboard. He did not rule out the possibility of a suicide pact." Hutchings said none of the 2,680 people aboard the Carnival Spirit witnessed the incident. Cruise line Carnival Corp. has been plagued by problems in recent years ranging from the catastrophic grounding of the Costa Concordia last year that killed 32 people off the coast of Italy to power failures, fires and backed up sewage. Last year, a passenger jumped from the Carnival Spirit but was quickly rescued by the ship's crew.